It’s all kicking off for Destiny today and not all of it’s good news, with Bungie cancelling this week’s Trials of Osiris due to an infinite heavy ammo glitch. 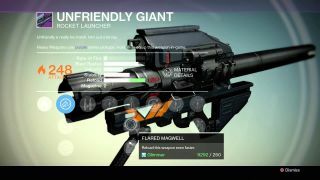 Bungie unsurprisingly won’t say how the glitch works, only that “we learned that some Guardians had discovered a way to earn unlimited rockets” (I'll tell you how in a sec). Because of that, the Trials of Osiris will be cancelled this weekend while the team investigates the source of the bug. The Iron Banner is also postponed for the time being as well. “We know this will come as a disappointment to some,” the blog post says of the cancellation, “Our hope is that it won’t be as disappointing as being denied a trip to the Lighthouse by an opponent with a Rocket Launcher that works like a clown car”. I don’t know, I kind of like the sound of that rocket launcher.